A flashing light reported "streaking" through the skies across much of Wales at breakfast time could have been a meteor, an expert believes. The light was first seen at 0730 GMT, with one eyewitness describing it as a "long line, thicker at one end, bluey-green and flashing". Reports of the light came in from the Lleyn Peninsula through to Swansea. 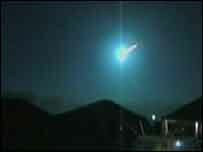 Jay Tate from Spaceguard UK said it was most likely to be a piece of space debris entering the earth's atmosphere. "It was frightening," said Morfudd Parry Roberts from Aberdaron, Gwynedd. "I was sitting having a cup of coffee by the window when I saw it (the light) move from the north towards the south. "It was a long line, thicker at the front end. It was quite frightening because it seemed so big." "It was a bluey-green and flashing. It was at least 50 times bigger than a shooting star and seemed to be gliding through the sky quite low down, not falling." Witnesses said the light lasted for a few seconds. "I'm just glad other people saw it as well," she added. Andrew Curley, 32, from Penrhyncoch, near Aberystwyth, was out walking his dog when he spotted a "huge fireball" racing out to sea. "My initial thoughts were that it was a plane on fire, but it was far too big and going far too quickly for it to be an aircraft," said Mr Curley. "It must have been something like a meteorite because it just lit up the sky." The Spaceguard UK centre at Knighton, Powys, is a privately-funded body looking at the threat posed to the earth by collisions with asteroids and comets. "Without having seen it myself I can't be certain, but from the description it sounds like a fireball, which is a big shooting star," said Jay Tate from the centre. The earth was hit by a "couple of tonnes" of debris from space every day, Mr Tate added, but usually they were small particles about the size of a grain of sand. Occasionally, however, debris was larger and from the number of people who saw the light on Wednesday he estimated it would have been about the size of an orange. "If it was bigger than that we would have heard a lot more about it," he said. The particles hit the earth's atmosphere at between 45-50,000 mph and the light seen is the white hot air around it, he said. The light is often described as green, he added, depending on the make-up of the rock. Roger Reed of Milford Haven Coastguard said they received two 999 calls from people who thought a ship might have sent out a distress flare. They initially sent two teams out, at Aberydyfi and Broadhaven, but called them back when further calls suggested it was a shooting star. "We had the first call at 0734. Then we had calls in from LNG site workers, the Pendine range vessel and someone on his way to work saying it looked like a shooting star," said Mr Reed. Swansea coastguards also logged a call by someone who had seen a similar light, he added. "The colour of the light seen varied, we had two say it was white, and one say it was green."